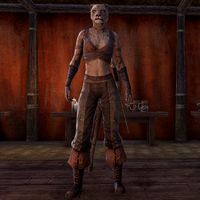 Azum is a Khajiit and Hadran's partner, found at his caravan. Before she worked for Hadran, she ran similar operations in Orcrest. In her journal, she reveals her belief that the Eyes of the Queen won't care about her operations while their security is being compromised in Pa'alat. Into the Vice Den: Help find a missing Khajiit. Hadran's Fall: Eliminate an evil slave trader. This page was last modified on 24 January 2018, at 21:09.